MontereyNews.org - This is NOT an authorized or official Town of Monterey Web site! PLEASE SCROLL DOWN TO VIEW THIS PAGE !!! on how their tax dollars are spent? by-law change at the Annual Town Meeting!. 'Village of Monterey, Massachusetts' by Leonard Weber - 32" x 6" - Copyright © 2001 Hayloft Gallery & Studio - All rights reserved. '''Tis the people that make the place"
Never been to this Web site before? Then please check out the Site Index menu below. Contact local Blogs, Click Here! Tower named director of Gould Associates Inc.
and on Monday evenings by appointment only. If Monday is a legal holiday, there will be no meeting. 1st and 3rd Thursdays: 4:00 p.m. - 5:30 p.m.
each Thursday: 4:00 p.m. - 5:30 p.m. 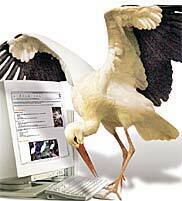 The growing list of Web Sites of Interest has been given its own page. Please Click Here! evening..........7 p.m. - 9 p.m.
Tuesday................ 1:00 p.m. - 8 p.m.
Wednesday........... 1:00 p.m. - 8 p.m.
Thursday.............. 1:00 p.m. - 8 p.m.
Friday.................. 1:00 p.m. - 8 p.m.
After knocking the idea about, it seemed that an independent Web site devoted to the Town of Monterey and its ways would be a good bet to keep people chilly in Winter and toasty warm in Summer. This Web site will be updated from time to time with stories that hopefully will pique the interest of Konkapoters, both native as well as seasonal, and contribute to an understanding of the idiosyncracies of the Berkshires. This is an independent creation, not affiliated in any way with either the Town of Monterey's official Web site (at www.Monterey-MA.org), or with the monthly newspaper publication 'Monterey News' sponsored by the Monterey United Church of Christ. Please feel free to send in via e-mail or snail-mail your articles and letters for publication. This Web site will accept and publish anonymous letters and articles, and will protect its sources of information. Monterey, MA. and Washington, D.C. I've been to Washington again, this time to protest the inauguration of President George W. Bush. I don't believe he was fairly elected this time any more than in 2000, but even if he had been I would be standing with others to show how deeply I disapprove of his policies, foreign and domestic. This is the fourth time I've taken the midnight bus to D.C. since this president took office. There is a certain similarity to these experiences: the cramped ride down with other protesters, talking politics and peace, sharing snacks and songs. Each person has a strategy involving water bottle, sandwich, clothing, and signs. This time some of us wore white armbands to signify mourning for those killed in Iraq. Washington can be wicked cold in the early January morning, before the sun hits the streets. We had snow in the air this time, and something else, too. This time, the actual object of our ire would be present. He would not be in Mexico or at Camp David, but driving by in a motorcade. We planned to line Pennsylvania Avenue and then turn our backs as he went by. After a few hours of marching and singing and waiting at a checkpoint, the moment arrived. I couldn't see a thing except the backsides of thousands of other protesters, but then this incredible roar rose up from everyone and they turned around. (I was now looking at their frontsides.) So I figured the limousine was out there somewhere and I turned my back to it, too. Many long miles and hours later we got home, all tired out, our sandwiches eaten and our signs a little rumpled. People started asking me right away: What was it like? When you turned your back, do you think anyone noticed? McAllester: sour grapes because her candidate lost. Back from Washington and all self-righteous and sour-grapes, Bonner McAllester is angry because her candidate didn't win. She's in denial when she says she doesn't believe George W. Bush "was fairly elected this time any more than in 2000" (and of course, she fails to provide any clues to inform us just how she comes to this ridiculous conclusion). Describing her "cramped" midnight bus ride to Washington with other anti-Bush activists, she details her self-styled "protest" at the Inaugural Parade, and bemoans the fact that when it was time for her big moment to remonstrate against the passing election winner, she "couldn't see a thing except the backsides of thousands of other protesters." Perhaps if Ms.McAllester were to set her sites higher than the backsides of other angry people, she might better understand why Mr. Bush carried both electoral and popular vote this time, and more importantly, why he and the Republicans won hands-down in the national arena of ideas. From the sound of Ms.McAllester's bitter rant, one would also think a visit to the nation's capital during the latest climax of the four-year presidential election cycle was something to dread rather than to celebrate. My own experience on Inaugural Thursday was far different than Ms.McAllester's. The swearing-in was exhilarating -- an event giving insight into American history; and immediately following the ceremony were receptions, celebrations, and some good old-fashioned partying. This may sound corny to the sophisticated effetes in this bluest county in the bluest of states, but it was damn refreshing to witness history -- and especially to witness in person this President taking the Oath. To my left sat a middle-aged husband and wife from York, PA (about three hours north of DC). To my right were two former college buddies, one now lived in Lynchburg, VA while the other had flown in for the event from central Illinois. The Lynchburg guy had driven five hours. Behind me sat three middle-aged women from Michigan whose coats bore big yellow buttons supporting John Kerry. They said they were quite proud of Mr. Kerry and that they were all there as Americans to share the history of the moment. About twenty minutes before the noontime oath-taking, a welcome Sun broke through clearing sky. It remained bright and cheery throughout the duration of the ceremony. I never found out whether TV commentators made note of Sol's blazing noontime appearance, but to me it immediately held wonderful significance and gave special moment to the occasion, more so than the event already had. The Sun this day not only warmed, it gave blessing upon the entirety of the proceedings unfolding below. The country was watching and simultaneously going through this quadrennial political ritual, and it was as if the Sun was giving its imprimatur. In that single moment, the historical magnificence and uniqueness of this whole American 'thing' came into perspective, at least for this observer. Afterwards, as all federal officialdom emptied the upper stands and the band filed out and folks were leaving the section where I sat, I hung out a bit watching people pass by. Then, rather than going over to the overcrowded parade route to wait around for a fleeting glimpse of a moving limo with 2-inch thick tinted glass, I chose instead the party option. I had heard that Members of Congress were having open houses and that these were the places to be after the ceremony. Did I say there was food? Contrasted with Ms.McAllester's starvation rations of her one sandwich with bottled water, any Washington Inauguration becomes a movable feast courtesy of your local Congressional campaign committee no matter where you're from. All-you-could-eat buffet platters stocked with cold cuts, cheeses, sandwiches, salad fixings, shrimp cocktail, pastries, fruit, fresh-baked cookies, and refreshments were all free for any hungry mouth -- Democrat, Republican, or Independent -- willing to come in and just say hi. MOC's, their wives and families, staffs, and constituents and their families from all over the country converged this day within the halls of the House and Senate Office Buildings. There were funny stories, flesh pressing, and a whopping good time. I pigged out. In one MOC's office, I polished-off at least a pound of shrimp before attacking cold-cut sandwiches and finally, of course, the chocolate-chip cookies. I didn't come across Ms.McAllester amongst this famished throng (though I caught a glimpse of a few T-shirts emblazoned with a variety of protest slogans), but she and her angry comrades would certainly have been welcomed had they just shown-up to partake of the feast. The atmosphere these open houses engendered reminded me of the good humor and exuberance at the annual Berkshire Botanical Garden 'Harvest Festival.' It was that kind of crowd, except these party goers, far away from home, were augmenting their good cheer with a never-to-be-forgotten living history lesson. 53 years and still going strong! Why YOUR tax bills are so high! Coming Soon! News of the Conservation Commission RELAX! Why bother with a permit at all?. Coming soon! MONTEREY -- December 5, 2001 -- As the December 2001 issue goes to press, it has come to my attention that an Internet Site is being set up using the name "MontereyNews.org®/™". 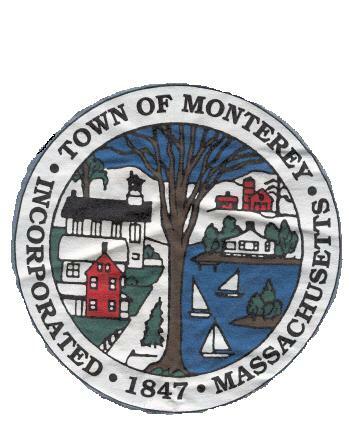 Legal Notice: The Town of Monterey Logo and Seal are used on this Web site and its Web pages without permission or authorization. Use herein of The Town Logo and the Town Seal on this Web site and its Web pages and/or upon affiliated Web sites and Web pages shall not be construed under any circumstances or in any way as intent to give this Web site, its Web pages and/or affiliated Web sites and Web pages an official character in any manner as defined by M.G.L. c. 268, § 35. MontereyNews.org, its Web site, Web pages, and/or affiliated Web sites and Web pages do not possess, and are not intended to be construed as possessing any authorization of official character, nor is there any intent whatsoever herein to assume an official character in any manner as defined by M.G.L. c. 268, § 35. MontereyNews.org®/™ is NOT affiliated with the Town of Monterey, Massachusetts, the Monterey United Church of Christ, or with the publication 'Monterey News' published monthly under the auspices of that organization.